The framework for understanding the world around us, from sports to science. How can we accurately model the unpredictable world around us? How can we reason precisely about randomness? This course will guide you through the most important and enjoyable ideas in probability to help you cultivate a more quantitative worldview. By the end of this course, you’ll master the fundamentals of probability and random variables, and you’ll apply them to a wide array of problems, from games and sports to economics and science. You'll need an understanding of basic algebra, including functions. For a lighter introduction to probability, see the Games of Chance course. 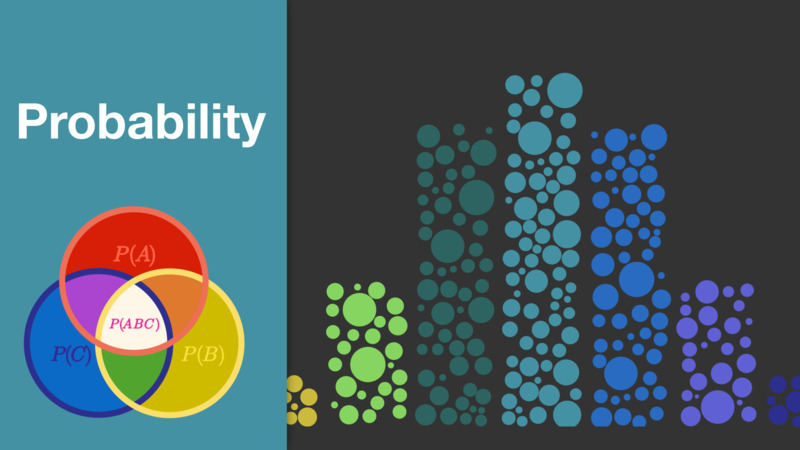 Think probabilistically and explore the wide-reaching applications of probability. Update your assumptions with the information around you. Sports, economics, science, and more. You aren't a true card shark unless you know your probabilities. The language of random variables: independence, distributions, and more. Know what outcome to expect when you're dealing with randomness. It's the mathematical way to describe how erratic your random variable is. Use these models to connect the theory to the real-world. When the world gets continuous, calculus meets probability. Model heights, stocks, or just about anything else with these distributions. Push the frontiers of your knowledge with these probabilistic techniques.